FYI - If you make this recipe to save money and/or time - it will do neither. It will give you the satisfaction of making a great homemade product. Truly a labor of love. 2 - Medium sized carrots - peeled and fine grated. 2 - lbs Ground Chuck. The ingredients used above will fill a 7QT pot. Scale your batch accordingly. We freeze measured amounts of sauce in a container - enough for 3-4 servings. Place a 7QT pot on medium heat. Add 2 tablespoons of olive oil to pot. Add carrot, 1/2 of diced onion, zucchini, squash, 1/3 of diced mushrooms, and garlic. Season with salt, pepper, & oregano. Stir. Sauté until veggies are tender (about 5 - 10 minutes). You might have to add more EVOO during sauté time. Onions will start caramelize. Season with salt & pepper to taste. Add about a teaspoon of fresh thyme and tablespoon of fresh basil. While tomato/veggie mixture is reducing, brown the ground chuck. In another pan sauté the remaining diced onions, remaining diced mushrooms, and some garlic until soft. Salt & Pepper to taste. Add ground chuck. Salt and pepper to taste. Sprinkle of dried oregano. Break up and stir. Drain excess grease. If you are freezing the entire batch - allow to cool before adding to sauce. 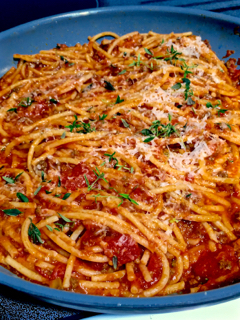 If you plan to use the sauce right away - add meat to sauce if it’s reduced to your liking. Cool before freezer packaging. Fill sink with enough cold water ice to reach 1/2 up the sauce pot when placed into sink. Stir every few minutes. Place lemon & onion slices, and minced garlic in bottom of 9 x 13 glass pan. Pour in 1/2 bottle of wine and melted butter. Season mixture with pepper, and a pinch of salt. 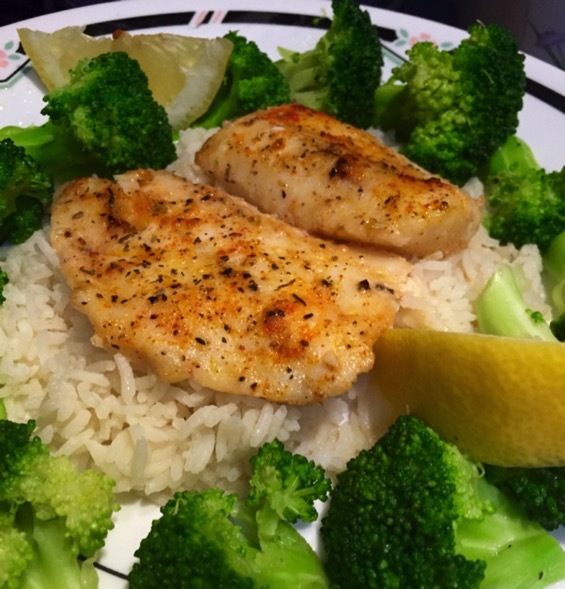 Drizzle each side of cod with olive oil. Season each side of cod with salt, pepper, granulated garlic, granulated onion, smoked paprika, and a sprinkle of Tuscan Sunset. Place seasoned fish in pan and cover with foil and place in oven. After 30 minutes, uncover fish and return for another 10 - 15 minutes. Fish will flake apart. If you have left-over salmon, this is an excellent way to use it! Don't worry reheating these guys if you make too many, they reheat well. Best in a toaster-oven. Remove any bones from salmon and shred into a large bowl. Add green pepper, onion, egg, salt, pepper, any additional seasonings. Mix well. Add enough bread crumbs to allow the mixture to form a 4" diameter by 3/4" to 1" thick patty. On medium heat, preheat pan and oil until it just starts to shimmer. Gently place patties into oil. Depending on size of pan, do not add too many patties. Do not crowd them. 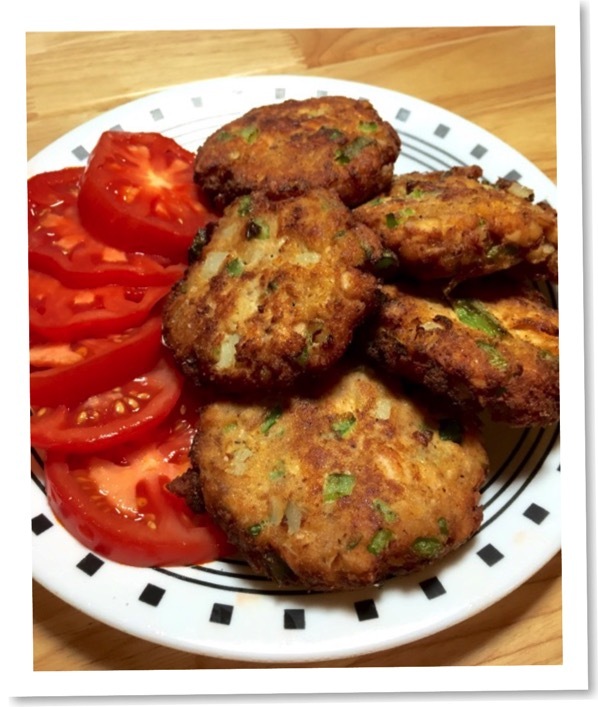 Fry patties for about 2 to 3 minutes per side. Gently flip to fry the other side. 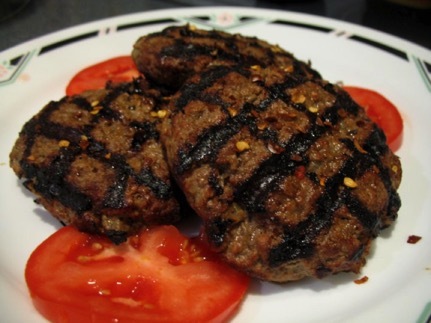 Patties should be golden brown. Watch them carefully so they don't burn. Remove from oil and place on paper towel lined plate. If you have number of patties to fry, keep plate in low heated oven to keep them warm. Need a quick meal? Instead of eating them, make the patties and put them in the freezer. Get them out about 20 - 30 minutes ahead of time to let them thaw slightly before frying. It only takes minutes to fry. Most meals around our house are like an episode of The Food Network's Iron Chef. We never know what we're going to have too far in-advance. It usually starts with "You know we have ________ in the fridge yet". However, in this case, I was digging through the freezer looking for a protein. Chicken - nah, just had it. Beef - nope, need to give it a rest. Pork chops - mmm nah-uh, just not feelin' it. Tonight's secret ingredient is...Chorizo sausage! Allez Cuisine! Combine rice, broth, butter, salt and seasoning in a pot. Bring to boil and stir once. Cover and simmer for 20 minutes. Add olive oil and carrots to large pan saute on med-high heat until carrots start to soften. Add a bit of water to help steam carrots. Add sausage to pan and stir. 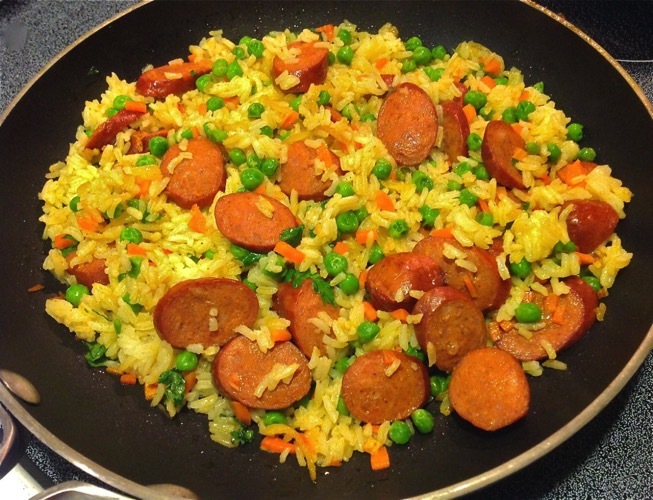 Add rice to pan when it's finished cooking. Add chopped fresh parsley right at the end. Slow-cooker to the rescue...again! It's been pretty busy around the Al & Peg House as of late. Weekends are doubly-busy, so in order to make good eats, we need some help. Whilst we're scurrying around the house, the slow-cooker is doing all the hard work. 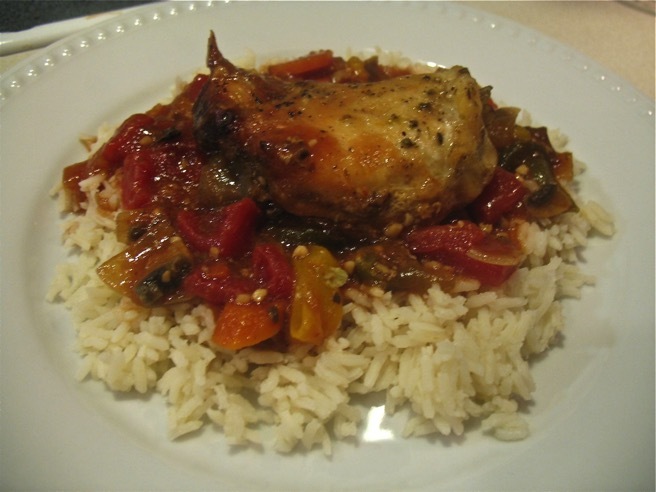 The original recipe calls for chicken drumsticks, but we used thighs instead - more meat on the thighs. 1. 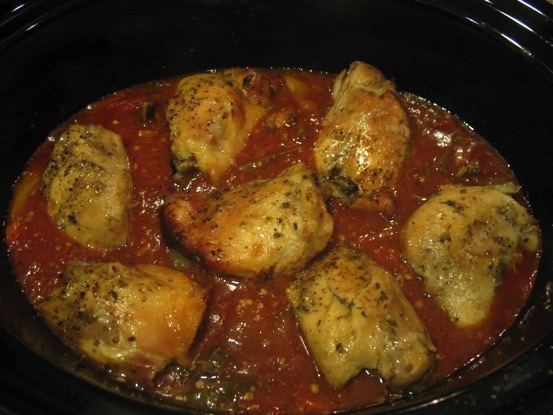 Combine mushrooms, celery, carrot, onions, sweet peppers, and garlic in a 5- or 6-quart slow cooker. Place chicken on vegetables. Combine broth, wine, tapioca, sugar, oregano, bay leaves, salt, and pepper; pour over chicken. 2. Cover; cook on low-heat setting for 6 to 7 hours or on high-heat setting for 3 to 3-1/2 hours. 3. Remove chicken; cover to keep warm. Remove and discard bay leaves. If using low-heat setting, turn to high-heat setting. Stir in undrained tomatoes and the tomato paste. Cover and cook for 15 minutes more. 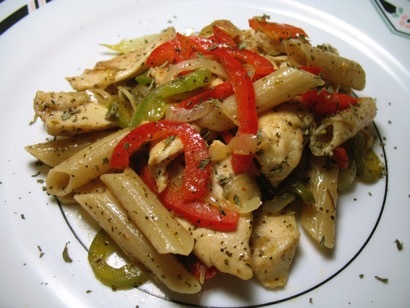 Serve vegetable mixture over chicken and cooked pasta or rice. This is crazy simple - takes about 5 - 10 minutes of prep work before you leave for work. Simple is what I need in the morning 'cos I'm usually half asleep when I'm putting this together. 1/2 - 3/4 cup of water or gluten-free beef broth or red wine. 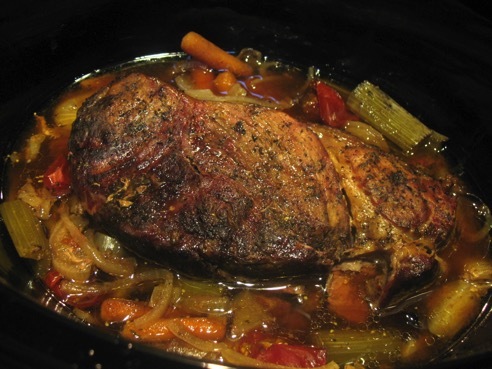 Place veggies on the bottom of the slow cooker. This gives the meat a bed of flavor to rest on. Season both sides of the frozen meat with salt, pepper, granulated garlic, granulated onion, Herbs de Provence. Use whatever herbs/seasoning you like - be creative! Place frozen meat on top of veggies. Set slow-cooker to stun (low). For us, the cooking process is about 9 hours by the time someone gets home. Walk out the door and return 8 - 9 hours later to some really great smells! When I get home, I strain the veggies from the liquid. After 9 hours, they've given their little veggies lives to flavor the meat and the liquid for the gravy. In a sauce pan heat up the liquid. Make slurry with the gluten-free flour and some water. Whisk the slurry into the pan. Allow to come to a boil and thicken. If it's not thick enough, make and whisk in a bit more slurry. Turn down the heat to a simmer. Season gravy to taste. If you've ever wondered what type of herbs to use, my Facebook friend Jimmy Boswell [aka the Gluten-Free Chef] from New Zealand created this very handy chart. He suggest which herbs to use for selected meats or veggies. The general rule for using dried is use ¼ dried herbs for what’s suggested for fresh amounts in a recipe. You can reverse this if dried is suggested and you have fresh. Beef Basil, Bay leaf, Caraway, Chervil, Lovage seed, Cumin, Garlic Fenugreek, Ginger, Marjoram, Oregano, Parsley, Rosemary, Sage, Savory, Tarragon, Thyme and Peppermint. Chicken Thyme, Anise, Basil, Bay leaf, Borage, Chervil, Chives, Cinnamon, Cumin, Dill, Fenugreek, Fennel, Garlic, Ginger, Lovage, Lemon Balm, Marjoram, Mint Oregano, Parsley, Rosemary, Saffron, Sage, Savory and Tarragon. Duck Bay, Rosemary, Sage, Sweet Marjoram and Tarragon. Fish Anise, Basil, Borage, Caraway, Chevil, Chives, Dill, Fennel, Garlic, Ginger, Marjoram, Oregano, Parsley, Rosemary, Saffron, Sage, Savory, Tarragon and Thyme. Fish - Baked or Grilled Basil, Bay, Caraway, Chervil, Chives, Dill, Fennel, Lemon Balm, Lemon Thyme, Lovage, Marjoram, Mints, Parsley, Savory, Tarragon and Thyme. Fish - Oily Fennel and Dill. Fish Soups Bay, Lovage, Sage, Savory, Tarragon and Thyme. Goose Fennel, Sage and Sweet Marjoram. Ham Lovage, Marjoram, Mint, Mustard, Oregano, Parsley, Rosemary and Savory. Lamb Basil, Bay leaf, Cinnamon, Coriander, Cumin, Chervil, Dill, Garlic, Ginger, Lemon Balm, Lovage seed, Marjoram, Mint, Parsley, Saffron, Rosemary, Sage, Tarragon, Thyme and Savory. Liver Basil, Dill, Marjoram, Sage, Savory and Thyme. Pork Anise, Caraway, Cardamom, Coriander, Chervil, Dill, Garlic, Ginger, Oregano, Rosemary, Saffron, Sage, Tarragon, Fennel, Lovage seed, Marjoram, Savory and Thyme. Rabbit Basil, Bay, Marjoram, Lovage seed, Rosemary and Sage. Salmon Dill seed and Rosemary. Seafood Basil, Bay, Chervil, Chives, Dill, Fennel Seed, Marjoram, Rosemary, Tarragon and Thyme. Turkey Basil, Garlic, Marjoram, Oregano, Rosemary, Saffron, Sage, Savory, Tarragon, Thyme, Parsley and Sweet Marjoram. Veal Basil, Bay leaf, Chervil, Chives, Ginger, Marjoram, Mint, Parsley, Rosemary, Sage, Savory and Thyme. Venison Bay, Lovage seed, Rosemary, Sage, Savory and Sweet Marjoram. Artichokes Bay, Savory and Tarragon. Asparagus Chives, Lemon Balm, Sage, Savory, Tarragon, Thyme, Chervil, Dill and Tarragon. Avocado Dill, Marjoram and Tarragon. Beans Dried Savory, Cumin, Garlic, Mint, Oregano, Parsley, Sage, and Thyme. Beans, Green Savory, Basil, Caraway, Cloves, Dill, Marjoram, Mint, Sage and Thyme. Broccoli Basil, Dill, Garlic, Lemon Balm, Marjoram, Oregano, Tarragon and Thyme. Brussel Sprouts Dill, Sage and Savory. Cabbage Basil, Caraway, Cayenne, Cumin, Dill, Fennel, Marjoram, Sage, Savory, Borage, Dill seed, Mint, Oregano and Savory. Carrots Anise, Basil, Chervil, Chives, Cinnamon, Clove, Cumin, Dill, Sage, Ginger, Marjoram, Mint, Parsley, Savory, Tarragon, Thyme and Chervil. Cauliflower Basil, Caraway, Chives, Cumin, Dill, Garlic, Marjoram, Parsley, Rosemary, Savory, Tarragon and Fennel. Corn Chevil, Chives, Lemon Balm, Saffron, Sage and, Thyme. Eggplant Basil, Cinnamon, Dill, Garlic, Marjoram, Mint, Oregano, Parsley, Sage, Savory and Thyme. Lentils Garlic, Mint , Parsley, Savory and Sorrel. Mushrooms Coriander, Marjoram, Oregano, Rosemary, Tarragon, Thyme, Basil, Dill, Lemon Balm, Parsley, Rosemary and Savory. Onions Basil, Marjoram, Oregano, Sage, Tarragon and Thyme. Parsnips Basil, Dill, Marjoram, Parsley, Savory and Thyme. Peas Caraway, Chevil, Chives, Rosemary, Savory, Tarragon, Thyme, Basil, Chervil, Marjoram, Mint, Parsley and Sage. Potatoes Parsley, Basil, Caraway, Chives, Coriander, Dill, Fennel, Lovage, Sage, Marjoram, Oregano, Rosemary, Tarragon and Thyme. Spinach Anise, Basil, Caraway, Chevil, Chives, Cinnamon, Dill, Rosemary, Thyme, Borage, Marjoram, Mint, Sage, Sorrel and Tarragon. Squash Basil, Caraway, Cardamom, Cinnamon, Cloves, Ginger, Marjoram, Oregano, Rosemary, Sage, Savory and Dill. Tomatoes Basil, Bay leaf, Chives, Chervil, Coriander, Dill, Garlic, Lovage, Sage, Marjoram, Oregano, Parsley, Rosemary, Savory, Tarragon and Thyme. Turnips Dill seed, Marjoram and Savory. Zucchini Basil, Dill, Marjoram, Rosemary and Tarragon. This was part of a very fallish Saturday night dinner. What you don't see is the roasted squash. In the 20 years that Peg and I have been married, we've never roasted a chicken. We've done turkeys countless times, but not chickens. Why? Don't know. 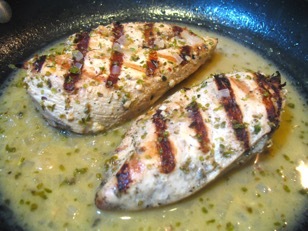 99% of our chicken comes in the form of boneless-skinless breasts...it's quick, it's easy, it's versatile. Well, things have changed. Some days it's like Iron Chef Kitchen Stadium around our house - I never know what is going to turn up. Friday night I helped put away groceries and came across a whole chicken. Peg: "Yeah, I think we need to roast a chicken to go along with that squash." Me: "Are you going to make Beer Can Chicken?" Peg: "I would but we don't have any gluten-free beer in cans". Now I'm sure we could've worked out the logistics of making a gluten-free beer can chicken if we put our minds to it, but we had a zillion other things to do around the house on Saturday. As I was recovering from my yard raking & mowing induced myocardial infarction, I decided to consult one of my friends about a roasted chicken recipe. It didn't take long before he suggested a recipe from Tyler Florence of Food Network fame. I decided on Tyler's recipe because 1) there is only a handful of ingredients 2) there is only a handful of steps 3) it was going to taste great! I don't like following recipes in the first place, and it's even worse when it's long and drawn out...and often times organized weirdly...and often times makes me swear at it [maybe I'm the one that's organized weirdly, but that's whole 'nother post...]. Some people like gourmet-type foods with an ingredient list as long as your arm and a set of directions that is as thick as War and Peace. I have neither the patience nor the time for that! I'm a simple guy, that likes simple, but great tasting gluten-free food. Tyler's recipe is a perfect example of how you can take simple ingredients and make amazing food! Yes, "the whole is greater than the sum of its parts". This recipe is a keeper. In our house we call it "Company Food" [food we'd serve to guests]. 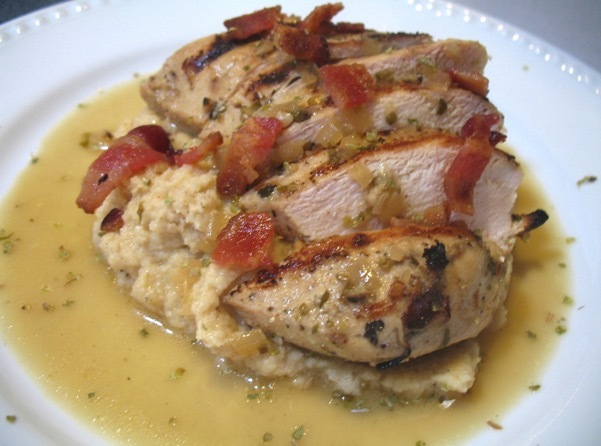 Tyler's recipe [and many others] calls for rinsing the chicken, however the USDA suggests that rinsing can spread bacteria thus increasing cross contamination risks. 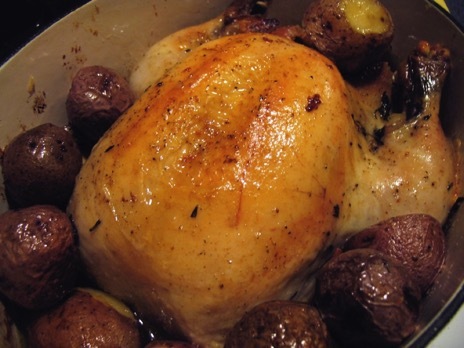 When cooked properly (internal temp >165) any bacteria on the chicken will be destroyed. Season the cavity with salt & pepper - after removing the bag of "goodies" found inside. Stuff the herbs, garlic & lemon inside the cavity. Tie the legs together and place into roasting pan. I used our dutch oven, it was a snug fit so I didn't tie the legs. Season outside liberally with salt & pepper and drizzle the olive oil over the entire chicken. Toss in the potatoes around the chicken. Roast for 1 to 1 1/2 hours. Remember to baste the chicken with the drippings every 20 minutes. Check internal temp by inserting an instant read thermometer into thickest part of of thigh - it should read 165 degrees. Remove from pan and let rest for 10 minutes before carving. Note: We saved the pan drippings, added the carcass (and the head of garlic) back to the dutch oven and covered it with tap water. Let this come to a boil for 10-15 minutes and strained the liquid gold into a large bowl or measuring cup. After cooling, place in fridge. The fat will rise to the top to be skimmed off later. This will be the base for some killer chicken soup! 1/2 medium onion - finely diced. Flatten out hamburger on a plate. Sprinkle the salt & pepper to taste. A few splashes of Lea & Perrins to taste. A few splashes of A1 to taste. Mix hamburger and ingredients together. Form each portion into patties. I make a ball, place it on a piece of waxed paper large enough to folder over the top - then use a small 4-5" plate to press it flat to desired thickness. No high-tech burger presses for me! Red pepper flakes if you like a little fire in your burgers. Add a splash of A1 Steak Sauce to the meat before mixing it. Put dressing ingredients in an a small-medium bowl and whisk together. Put all veggies in a large bowl, pour on dressing and carefully mix ingredients together. Chill in the fridge.